You can call me disappointed. I was psyched for the Google-Samsung event that was scheduled to take place in San Diego, where I live, this week. But then the companies cancelled, claiming they wanted to show respect for Apple cofounder Steve Jobs, who died last week. Bloggers, journalists and phone geeks had gone gaga over the "Unpacked" event, which presumably was to announce the next Google phone and Android 4.0 -- aka Ice Cream Sandwich. The new invites are out, and as you can see from the image right, there's little doubt what's coming. But the location isn't good for me, and perhaps not for you. 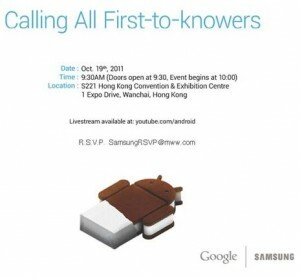 From the companies: "The Samsung/Google media event has been rescheduled to take place on October 19 in Hong Kong, China at S221 Hong Kong Convention & Exhibition Centre. The event starts at 10:00 a.m. HKT with doors opening at 9:30 a.m. HKT. The event livestream will be available at YouTube.com/Android at 10 p.m. EST on October 18 for US media who cannot attend the event". I don't keep a public calendar, but if you want to know where I'll be on the evening of October 18, now you do: Sitting in front of the Lenovo ThinkPad 420s watching the launch event half-a-world away. I had so looked forward to holding gooey Ice Cream Sandwich in my hands and (figuratively) licking the new smartphone's screen. It's rare any company launches anything in San Diego. Hong Kong simply isn't in my travel budget. By all indications, the new smartphone and Android 4.0 are coming very soon following their unveiling next week. Yesterday, the final Google TV 2.0 SDK released to developers. The forthcoming update is based on Android 4.0. Over the weekend, Samsung smartphone model I9250 passed through the FCC, well, the GSM version supporting AT&T and T-Mobile networks. Then there are the boatloads of rumors -- enough to sink a ship steaming to Hong Kong -- leaked screenshots, YouTube videos and specs. The phone, has many names, with Nexus Prime the most commonly used. I have no inside skinny on the specs, but I expect they'll be similar to the recently announced Galaxy S II HD LTE, without the LTE (at least in United States, based on FCC filings) -- no better, and likely not as good. The S2 HD LTE packs a 4.65-inch Super AMOLED display -- 1280 x 720 screen resolution, with 316-ppi pixel density; 1.5GHz dual-core processor; 8-megapixel camera; and the usual stock of features. The LTE phone is only 9.5mm thick. Based on a teaser video Samsung released before the event was cancelled in San Diego, Nexus Prime (or whatever it's called), will have a curved screen -- like predecessor Nexus S. There will be a tablet, too. What? You thought Prime was just a phone? Samsung has a new Ice Cream Sandwich tablet coming, too. Considering how satisfied I am with Galaxy S II, my interest is Ice Cream Sandwich (which likely won't be available for the smartphone anytime soon -- no thank you, AT&T and Samsung!). There are screenshots -- believe them or not -- in comments to a Nexus Prime story on Romanian tech site mobilissimo.ro. Where will you be October 18 or 19 (depending on time zone)? Update: Rumored Ice Cream Sandwich screenshots replaced with more interesting video. Google is now Candyland.